"This is a very easy and quick dessert. 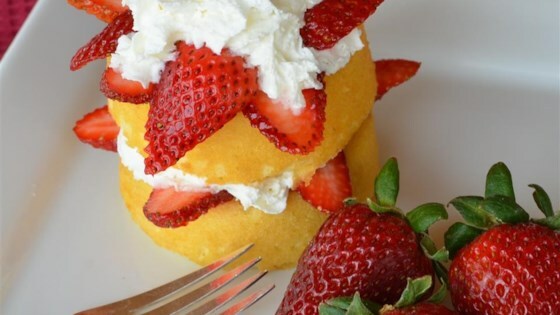 If you love strawberries and shortcake, then this is the recipe for you!" Place strawberries in a container with a lid; add sugar and stir to coat. Place lid on the container and refrigerate until sugar has dissolved, at least 15 minutes. Place a 1 dessert cup in each serving bowl and smother with strawberries. Top each with whipped cream. Whipped topping can be used in place of the whipped cream, if desired. I'm not a big fan of these dessert cups, but it worked in a pinch for a dessert to serve. I think I prefer angel food cake or pound cake. However, the berries and syrup are just right. This is a great simple dessert. It goes together so quickly. I love serving this to my family. so, i love it sooooo MUCH!!!!! My family loves this quick and easy dessert. Yum! The more strawberries, the better!